A very favorite pastry I just love! 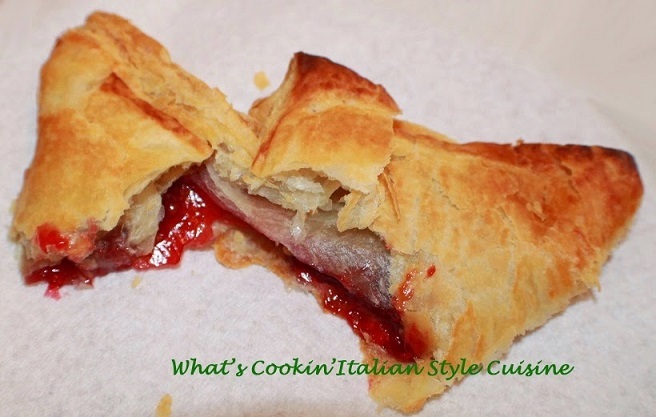 Red Raspberry filled flaky pastry is one of the best desserts for me. I tore one open to show you how delicious the inside is with this puff pastry dough. Of course, if you prefer them with frosting you can just drizzle that over the tops. I like them plain as the filling and pastry are sweet enough for me.! Enjoy! Mix 1/4 cup of flour with 14 tablespoons softened butter to make a smooth paste. Shape into a square approximately 1/2 inch thick. Cover and refrigerate 30 minutes. In another bowl mix the cold water, 2 tablespoons of butter, and the remaining 1 3/4 cup of flour and a pinch of salt. This will be an elastic, shiny dough. Knead for about one minute. Refrigerating the dough makes this easier to roll the dough without breaking it. On a lightly floured board, roll out the shiny dough 1/4 inch thick. Place the butter dough square onto the shiny dough and wrap the ends of the shiny dough to enclose the butter dough in an envelope. Roll out the dough envelope to 1/4 inch thickness and fold in thirds like a business letter. Roll again in the opposite direction and fold in thirds again. Refrigerate 30 minutes and repeat the process twice for a total of six times of folding in the process. This will be making many of hundreds of buttery layers. Cooling the dough is a very important step. After folding the dough the sixth time, refrigerate the dough once more, and then it will be ready for use for any recipe that requires puff pastry. Tip: The oven must be preheated to a high temperature, 475 then turned down to 400 while baking, when the dough is placed in the oven. If the oven is not hot, the butter will melt and the moisture will evaporate before steam can form to separate the layers. You will end up with a tough non-flaky crust. For Turnovers roll out to 1/4 inch thickness into squares, fill with filling and fold to make a triangle. Brush with egg whites to seal the edges. I like to freeze mine before baking for at least an hour. Bake in preheated oven lowering to 400 degrees until browned on tops around 25 minutes. Heat on a very low heat medium saucepan the raspberries tossed with the cornstarch mixture. Stir until it becomes thick and jam like just a few minutes until fruit is softened and comes together. Cool or place in refrigerator until ready to fill your turnovers. Optional: you can frost them with powdered sugar/water mixture and drizzle over the tops.